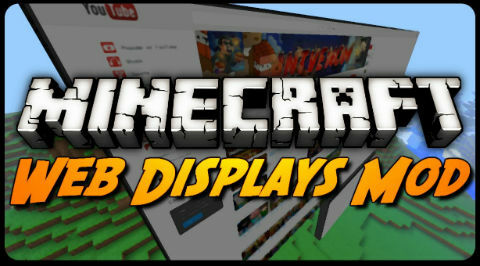 Web Displays Mod adds a Web Screen Block that enables a real web browser to show up when you place a few of those blocks (144 in fact) in a 16x9x1 surface shape and right-click it. You can go on YouTube, watch some videos or listen to your favourites musics, or watch the stream of your favourite streamer, and everything in-game. So, in fact, you will need 9 rose red, 9 catcus green, 9 lapis lazuli, and 54 glass panes. Then, build a 16×9 wall with them, and right click on the side where you want the screen to appear (check that you don’t have any items in your hand). That’s it, you created your screen. Shift-Right Click to change the URL. To click on a link/button, simply right-click it with nothing in the hand. You have to right click the screen first and then the peripheral with it. Note that peripherals can be wherever you want in the world, there is no distance from the screen limit. It just have to be in the same dimension. After linking it to a screen with the linker, just right-click it with nothing in the hand, type whatever you want, and press Escape when you have done. This peripheral is a little bit special; it’ll repeat what a real screen will show (called “source”), but on another screen (called “repeater). The Remote Controller once linked to a screen will enable you to change the URL of its linked screen wherever you want; this might be usefull to make a screen control room and change the URL from far. Download the mod and WDlibs. Start the Minecraft launcher. Check that the selected Profile is Forge and click on “Edit Profile”. In the “Java Settings” category, check “Executable” and in the text field put the path to your javaw.exe from your 32 bits Java ! Click Save profile and enjoy. Usually it’s Program Files (x86) >> Java >> jre7 >> bin >> javaw.exe if this file can’t be found, then open Program Files (x86) if this directory doesn’t exist, then you have a 32bit windows, just start the game. Go to the Java directory. If it doesn’t exist or if there is no folders inside it, then please Install java 32 bits. Now open the jreX folder or jdk1.X.Y_Z where X is at least 7 (can be higher but NOT lower. If it’s lower, install java 7 32 bits). Open the bin folder. You have found you java 32 bits path. Copy it and past it in the “Executable” field, don’t forget to add javaw.exe after it. Go here and select “Windows offline (32-bit)”.